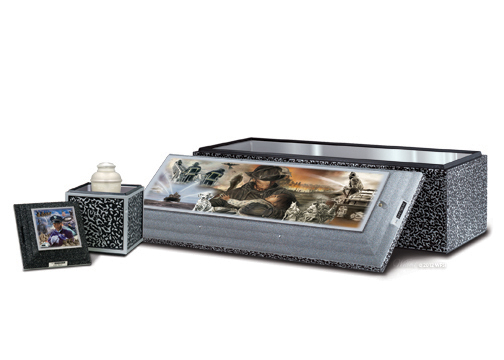 Witherbee & Whalen is proud to be a licensee of Wilbert, Inc.®, North America’s leading provider of superior ground burial and cremation products and services. Witherbee & Whalen, Inc. has been providing concrete burial products and cemetery services to local funeral homes since the 1920’s. In the early 1920’s, the concrete was mixed in a wheelbarrow and poured into one mold in the basement of the brick building that still serves as the main office of the business on Hodskin Street in Canton, New York. It took several men and a tripod set-up to service a funeral in the cemetery. Soon a Norwalk® license was acquired and Witherbee & Whalen’s affiliation with Norwalk Burial Vaults continued until 1968, when the business purchased Wilbert® territories in New York State. Our license agreement with Wilbert® includes service to St. Lawrence and Franklin in Northern New York State. Wilbert Funeral Services and Wilbert Licensees are honored to provide families of firefighters, law enforcement officers and emergency medical personnel who have died in the line of duty with a tribute worthy of their valor and sacrifice.